Posted on Tue, Feb 14, 2012 : 7:43 a.m.
A light overnight snowfall left some Ann Arbor-area roads slippery Tuesday morning, and emergency crews dealt with several crashes as a result. 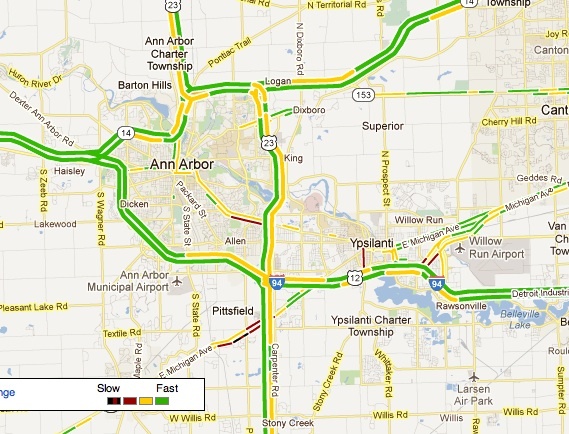 Crashes were reported on westbound Interstate 94 near Zeeb Road in Scio Township, westbound I-94 near Fletcher road near Chelsea, eastbound I-94 near M-14 in Ann Arbor and on southbound US-23 near Willis Road at 7:30 a.m. The National Weather Service said snow would continue Friday morning, mostly before 11 a.m. Additional accumulation was expected to amount to less than one-half inch, adding to about a half inch that fell overnight. Temperatures are expected to rise to around 37 Tuesday afternoon. Wednesday will bring a partly sunny day with a high of 39. Rain is likely Wednesday night with a low around 33. More rain is expected Thursday with a high of 38. The Washtenaw County Road Commission deployed its full fleet of 46 trucks to plow and salt roads at 4 a.m. Tuesday morning, said Jim Harmon, director of operations. Traffic slowdowns are shown in yellow on the map. For weather conditions and forecasts anytime, check out AnnArbor.com's weather page. Tue, Feb 21, 2012 : 3:48 p.m. I heard about accidents on every freeway around Ann Arbor (about 9:15 am) so I avoided them on my way to work...I was going 20-25 miles an hour and still sliding. If the salt trucks were indeed deployed at 4:00 a.m., why is it that I did not see any evidence of salt on the roads nor a truck until 20 minutes into my commute across town? I understand that there are a lot of roads to cover, but I took main roads in the hopes they would have been treated first...not the case. Tue, Feb 14, 2012 : 3:24 p.m.
Tue, Feb 14, 2012 : 4:01 p.m.
Tue, Feb 14, 2012 : 3:40 p.m.
Subaru drivers seem like they forget they have to stop. No amount of four wheel drive and snow tires are going to keep you from sliding when Subaru brakes are slammed on because someone pulled out in front of you or you come to a stop sign or light. Tue, Feb 14, 2012 : 3:06 p.m.
Tue, Feb 14, 2012 : 2:52 p.m.
Im sure its the road commissions fault because the roads weren't completely dry by morning commute. I have heard for those of you who haven't, that for winter driving, you should pretend there is a raw egg between your foot and the brake and accelerator pedel. Gradual, smooth motions help keep your car (or Hoveround) under control in inclement weather. Tue, Feb 14, 2012 : 6:35 p.m. Thank you. People say I drive like an old lady. Not sure whether it's a compliment or complaint. I just try to stay out of the way and keep distance between the care in front of me and my H.R..
Tue, Feb 14, 2012 : 2:50 p.m.
Why would anyone want to drive for the conditions? It's all WCRC's fault. Oh and throw in there A2 City's fault too. :/ Seriously though, that's some good sane advice Bertha Venation. Someone told me a buick ended up under a semi just east of Baker Rd. on the eastbound side just after 6 am also.